One of my favorite ways to enjoy the Spring season is with a freshly-baked pie, bursting full of sweet and tart fruit flavors. After all, we’re on limited time before the dreadful summer weather is upon us, and the idea of turning on an oven is one’s personal idea of a real-life horror movie. Speaking of horror, it is no secret that one of my absolute favorite horror icons is Vincent Price. While most folks can agree that Vincent could scare the daylights out of you simply by wielding a knife, it has been brought to my attention that so many of them are unaware that he had actual knife skills, and was an amazing chef! Vincent and his wife Mary spent their lives traveling the world, and indulging in food from the world’s finest restaurants and hotels. Their favorite recipes were collected in A Treasury of Great Recipes by Mary and Vincent Price, originally published in 1965. Vincent even had his own cooking show! 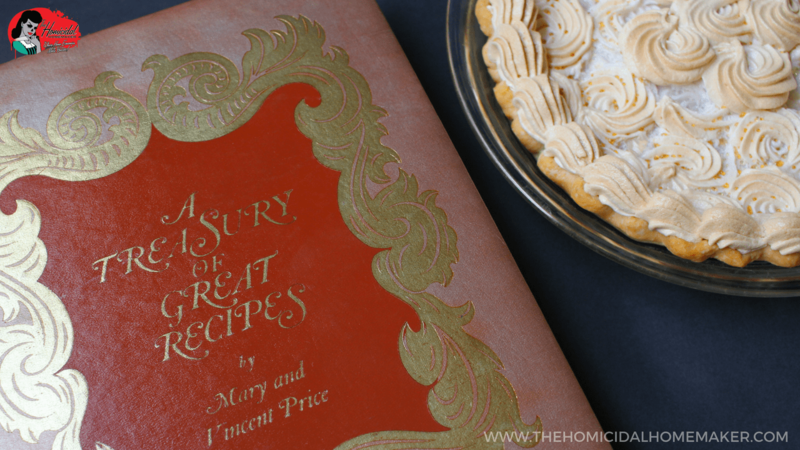 I purchased a first edition copy of A Treasury of Great Recipes by Mary and Vincent Price several years ago, as a present to myself (I seem to do this pretty often). I also purchased an original, rare copy of Cooking Price-Wise, a collection of recipes from Vincent’s television show of the same name; that book has since been reproduced. I also invested in a copy of Come into My Kitchen. I would spend many nights flipping through the pages of these cookbooks, admiring the photography, and reading the recipe instructions in his voice. 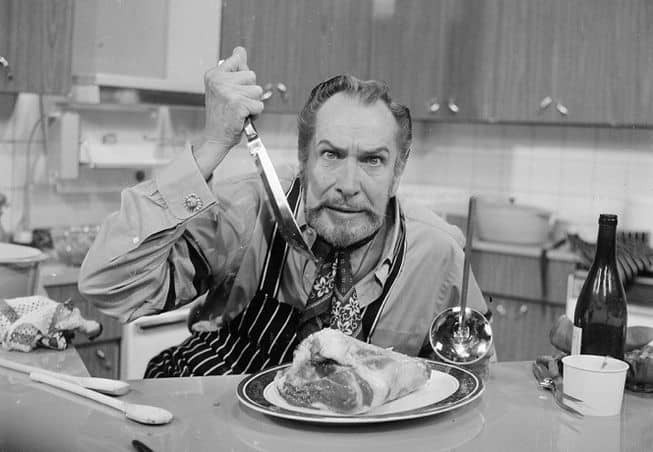 For my Cooking With Vincent series, I have made it a goal to cook at least one Vincent Price recipe per month, in honor of this incredible man, and the delectable recipes compiled among the pages of these books. Some recipes will be made exactly as stated, while others will be slightly modified to accommodate my dietary needs (ie: vegetarian-friendly). For this first installment of Cooking With Vincent, I chose a recipe that just screamed “spring” to me – a delicate Pineapple Meringue Pie from the Hotel Hana-Maui. I’ll let Vincent himself explain what is so lovely about this deliciously retro, tangy tropical dessert – but don’t forget to read it in his voice! I did slightly modify Vincent’s recipe by adding in vanilla extract, as I think it compliments the pineapple well. The result was one of the best tasting pies I’ve ever made, reminding me of the homemade pies my great-grandmother would make. 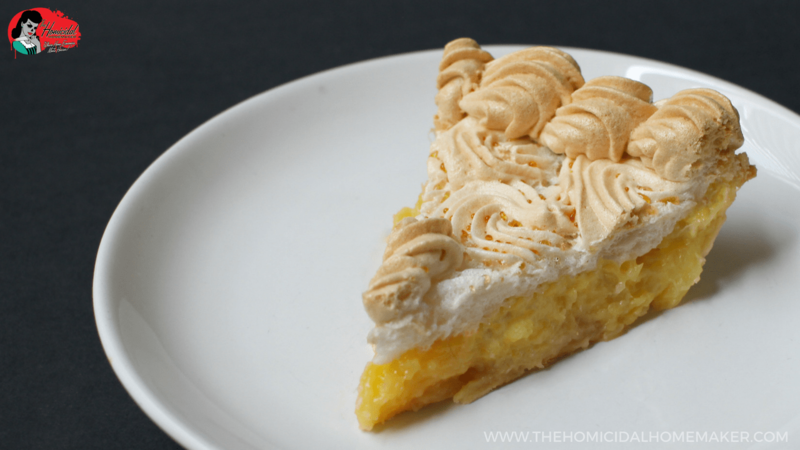 The pineapple filling has just the right amount of sweetness to go along with with the fluffy, slightly-toasted meringue on top, and my homemade crust was buttery, soft and accommodating to the complex flavors of the pie. If I were to change anything, next time I would double the pineapple filling for a deep-dish pie. 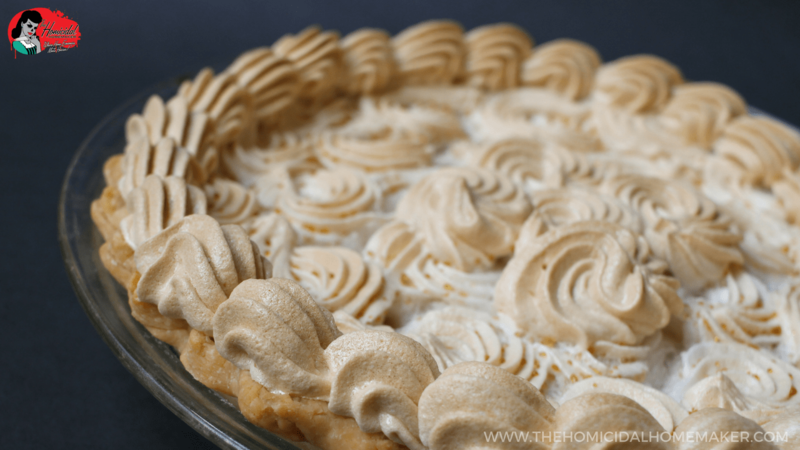 If you’re not a fan of meringue, this pie would also be to-die-for with lightly-sweetened fresh whipped cream on top. Oh, and the thought of a light sprinkling of chopped, toasted pecans with a bit of coconut is just too dreamy. That’s one of the best parts of a great recipe – it can be a springboard for your imagination (and tastebuds) to run wild. Paired with a cup of black coffee, this pie was pure bliss, bite after bite. I had so much fun making this recipe, and felt a special connection to Vincent Price as I prepared it and enjoyed it. I hope you all love it as much as my family did! From A Treasury of Great Recipes by Mary and Vincent Price (1965). Bake: a 9-inch pie shell. Kaci’s Notes: If you’re preparing your own, flute the edges, and dock the crust with a fork to prevent bubbling. Line the top of the crust with parchment or aluminum foil, and weigh it down with pie weights, sugar, rice, or beans – use what you have available. I use this silicone pie weight from Chicago Metallic. Bake for 7 minutes at 375º F; remove the pie weight, and bake for an additional 5 minutes, until golden brown. Remove from oven, and reduce the heat down to 325º F while you prepare the filling. In a saucepan put: 2 cups canned crushed pineapple, drained of its juice, 1 tablespoon of cornstarch, 3 tablespoons of sugar, 1 teaspoon lemon juice, and 1 tablespoon butter. Cook stirring frequently, until thick. Separate: 2 eggs. Beat yolks lightly. Pour a little of the pineapple mixture over the yolks, beat, and stir into the saucepan. Kaci’s Notes: this process is called tempering, where you are very slowly heating up the eggs by gradually combining them with a hot liquid, so you don’t end up with scrambled eggs in your pie. Cook mixture over low heat, stirring constantly, for 1 minute, or until yolks have cooked a little and thickened. Let this custard cook, then pour it into the baked pie shell. Kaci’s Notes: after removing from heat, stir in one Tablespoon of vanilla extract, before pouring the mixture into the baked pie shell. Kaci’s Notes: I made my meringue with only two egg whites, which were left over from the two egg yolks from the pineapple filling. Beat until frothy: 3 egg whites with 1/8 teaspoons salt. Add: 1/3 cup sugar, 1 tablespoon at a time, beating constantly. Add: 1/2 teaspoon vanilla. Beat until stiff glossy. Spread meringue over pineapple custard and bake in the slow oven for 15 to 20 minutes, or until meringue is delicately browned. Let pie cool before serving. Kaci’s Notes: I used a pastry bag to pipe rosettes over the top of my pie. Did you make this recipe? Or, have you made another one of Mary & Vincent Price’s recipes? Leave a comment below, or snap a photo and hashtag it #homicidalhomemaker for a chance to be featured! Previous articleGinger Voodoo – Horror Bath Products to DIE For! This looks so good! When does the cornstarch, sugar, and lemon juice get added? There isn’t a mention of that in the instructions. Also how much vanilla did you add to the filling? Hi Angie! It was so delicious. You definitely should give it a try! All ingredients except for the egg yolks are added at once (outlined in step three, not counting my own personal notes). I added 1 Tablespoon to the filling after removing it from the heat, and before pouring it into the baked pie shell. Thanks, Penny! His recipe for Pineapple Meringue Pie was super delicious. I can’t wait to make it again! In fact, every recipe I’ve prepared for my Cooking With Vincent series has been incredible. His French Bread recipe is my favorite! Thank you for posting this one, it is a classic that deserves revival!